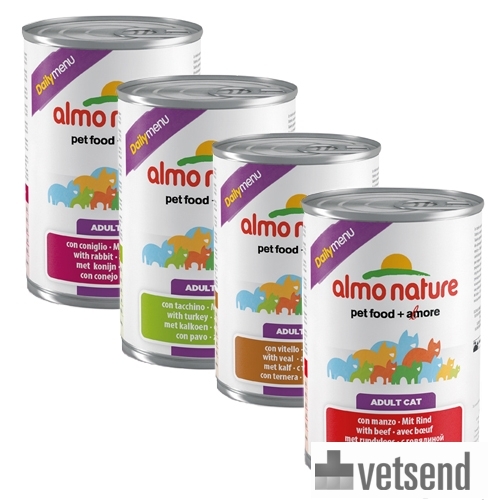 Almo Nature Daily Menu 400g Adult Cat Food is a pate for cats consisting of natural ingredients. Almo Nature's Daily Menu 400g Adult Cat Food is available for adult cats. This pate comes in 400 gram tins and is handy if you have several cats to feed. It consists of the finest natural ingredients, and the meat is derived from free range animals, so no hormones or antibiotics are used during breeding. In addition, the meat is rich in nutrition and flavour, because it is cooked and prepared without chemical treatment and preserved in its own cooking juices. To meet optimal nutritional requirements for your cat, vitamins and minerals are added. This makes it tasty and healthy for your cat. For a 100% nutritionally balanced diet, Almo Nature recommends that you give 60% wet food and 40% dry food to your cat daily. Daily menu 400g comes in 24 tins x 400 grams and is available in 4 different flavours. Have you used Almo Nature - Daily Menu 400g - Cat food before? Let us know what you think about this product.